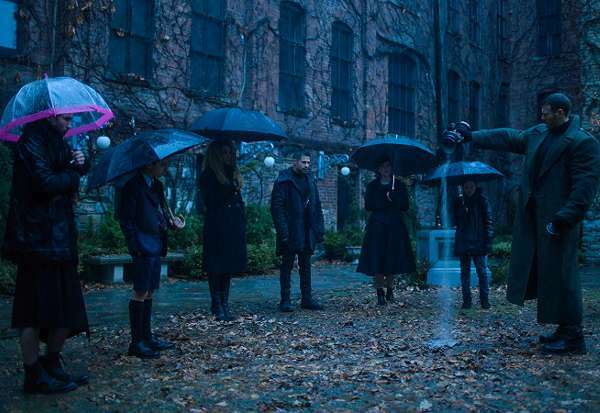 The Umbrella Academy is one of the most anticipated series of the year. The Netflix production is an adaptation for television by Steve Blackman of the popular comic book of the same name by Gerard Way (the singer of the rock band My Chemical Romance), illustrated by Gabriel Bá. The story revolves around the seven members of a dysfunctional adopted family of super-powered kids, raised by an peculiar millionaire. After the mysterious death of their mentor, the group has to team up to resolve what happened to him, and do what everybody is expecting from a squad of superheroes: to save the world from imminent destruction. The cast includes Ellen Page as The White Violin (Juno, Inception), Tom Hopper plays the strong Spaceboy (Game of Thrones), Robert Sheehan is the psychic drug addict The Séance (Misfits, Mortal Engines), The Rumor is a manipulative liar interpreted by Emmy Raver-Lampman (Hamilton), the troublemaker The Kraken is performed by David Castañeda (Sicario 2), and Aidan Gallagher completes the gang as the time-traveler The Boy. 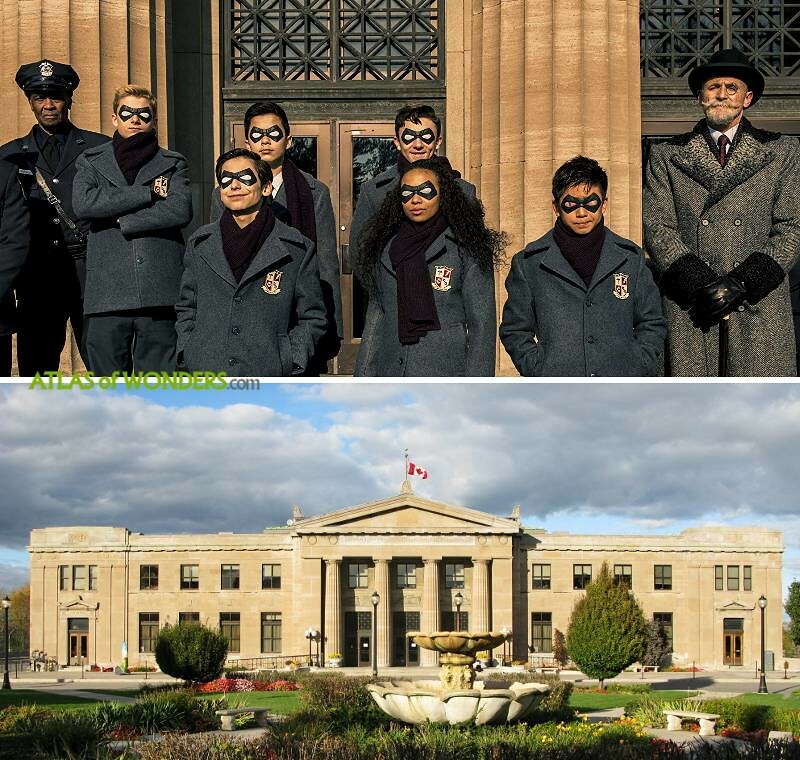 The Umbrella Academy was filmed in and around Toronto and Hamilton (Ontario, Canada). We have exclusive information about the filming locations of the series, and we will be updating this spoiler-free report with more details soon. 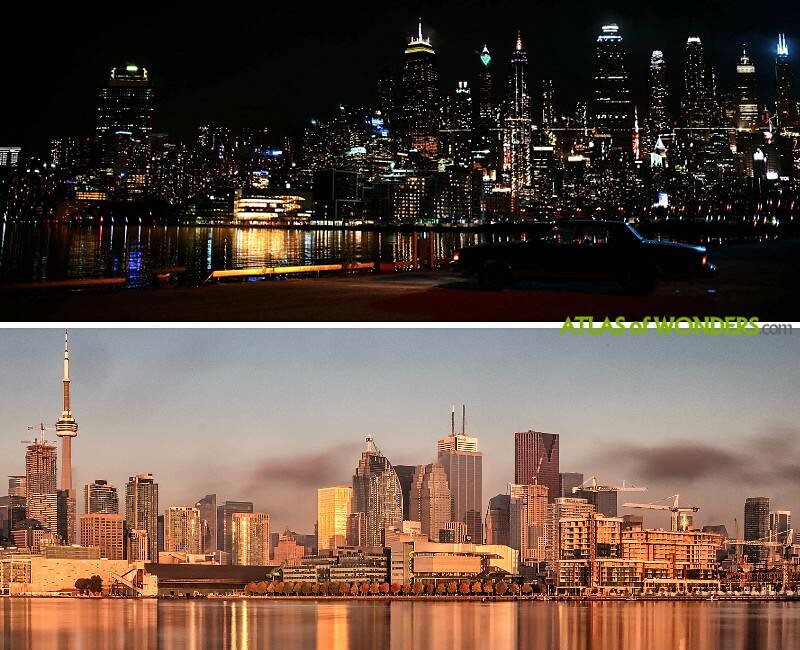 Where is The Umbrella Academy filmed? 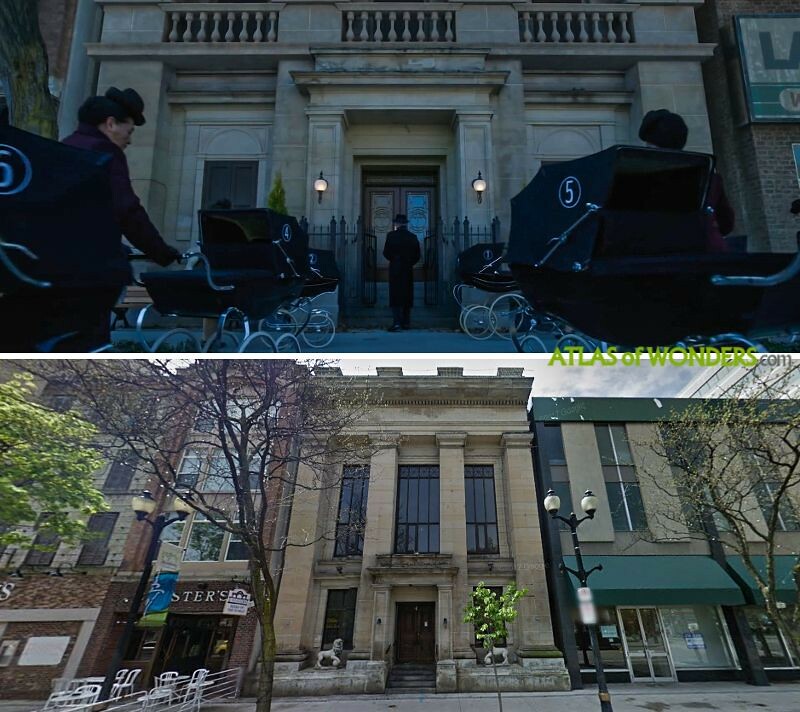 The entrance to the Umbrella Academy house, the old mansion of Sir Reginald Hargreeves alias The Monocle, is a building located at 4 King St E in Hamilton. The organ hall where Vanya goes for rehearsal with the orchestra is the Mazzoleni Concert Hall of The Royal Conservatory of Music. 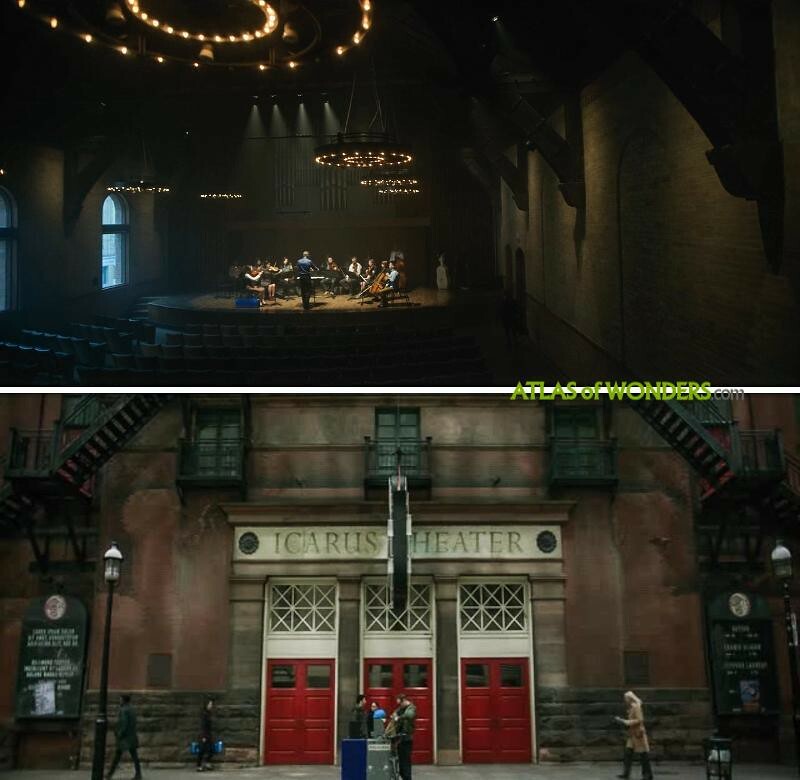 Below, a screenshot of the Massey Hall from episode 4. 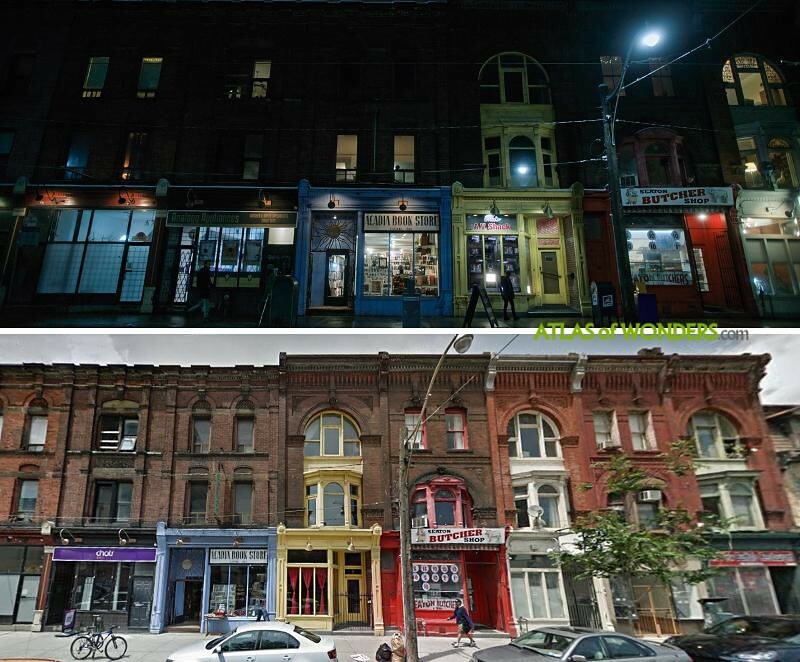 Vanya's apartment exterior is located in Queen St E. Filming notifications posted around the city informed that further filming took place in Little Portugal area and in Cube Night Club at 314 Queen Street West (episode 7th). 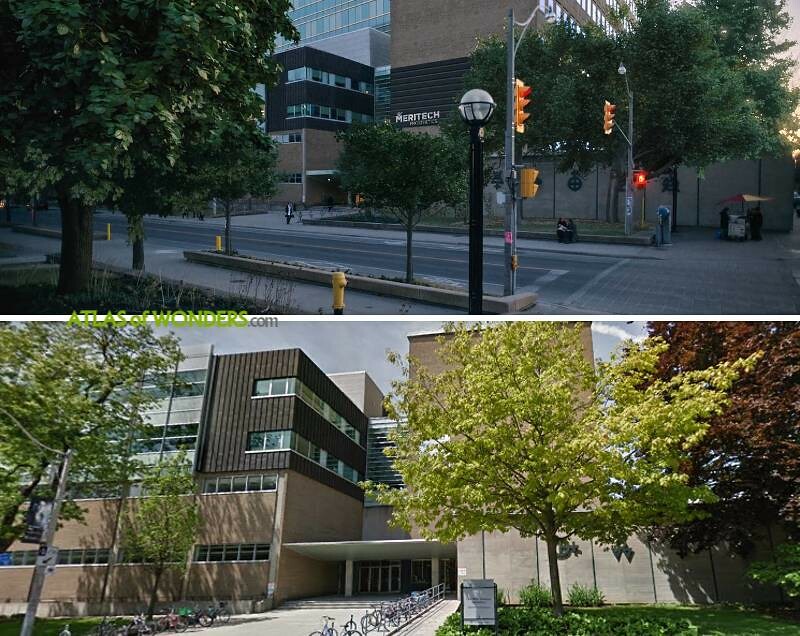 The Meritech prosthetics building is the Lash Miller Chemical Laboratories of the University of Toronto. The mechanic's workshop from episode 2 is located at 146 Ossington Avenue. 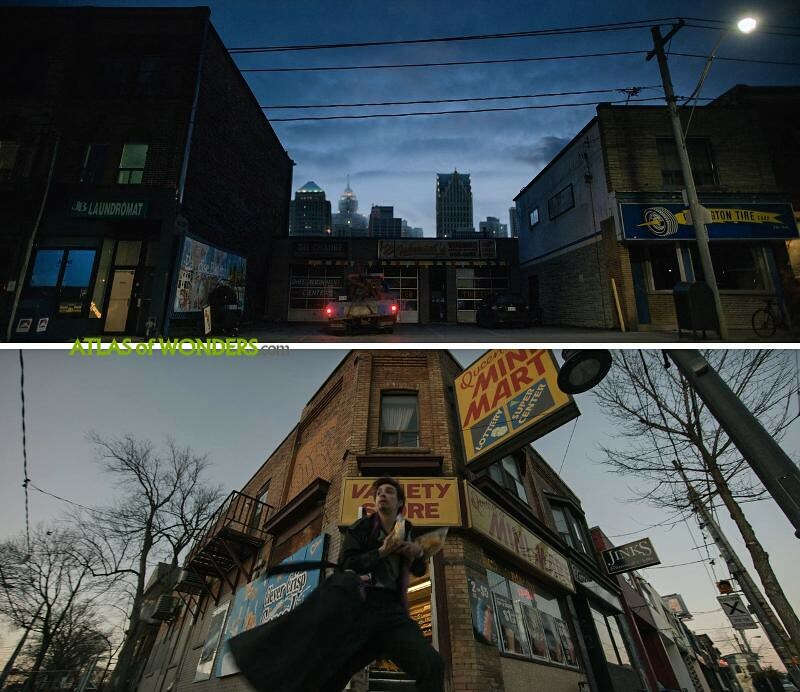 The Queens Mini Mart from episode 3 is a convenience shop at 1666 Queen St W (both in Toronto). 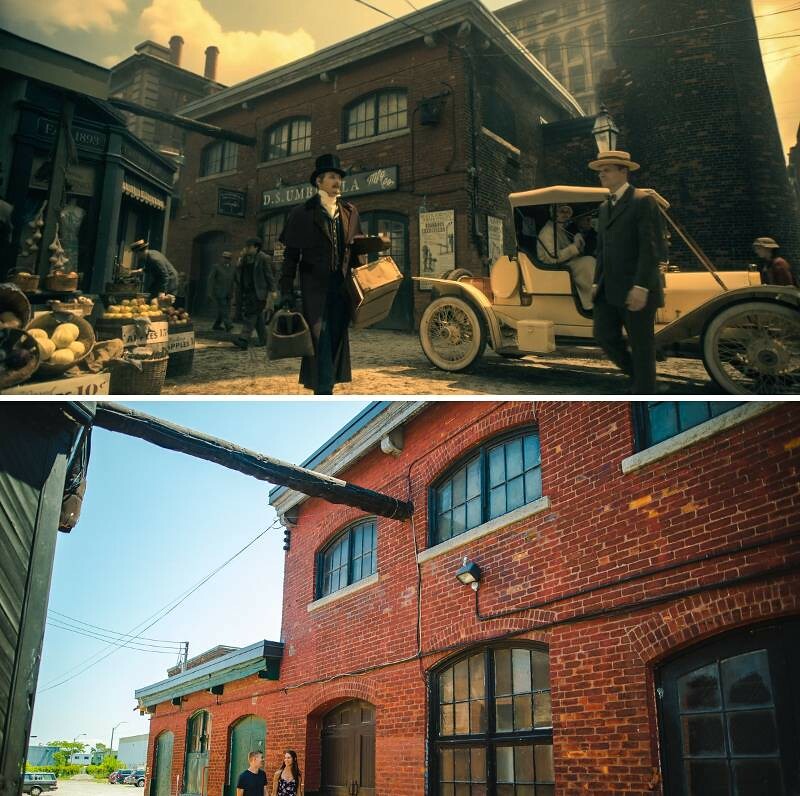 The Victorian vintage scenes from episode 10 were filmed in the historic industrial complex Cotton Factory in Hamilton. The buildings in the background and sections of the street were added using CGI in post-production. 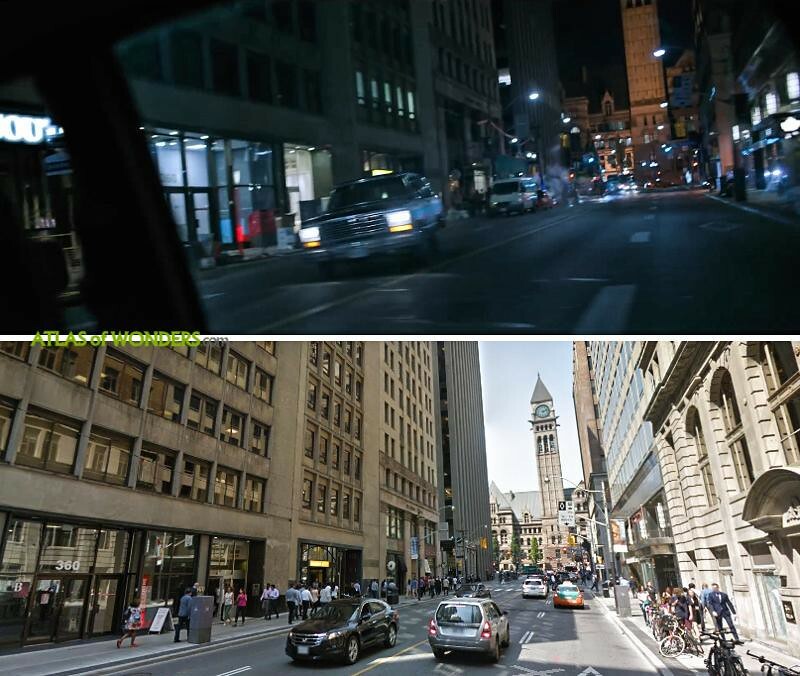 Can you help to improve this article about the filming locations of The Umbrella Academy? To complete and correct this report, any feedback, info or images that you may have are more than welcome, thank you! Thanks a lot for your help, updated! The cabin in Ep 8 is also used in the movie Polar. 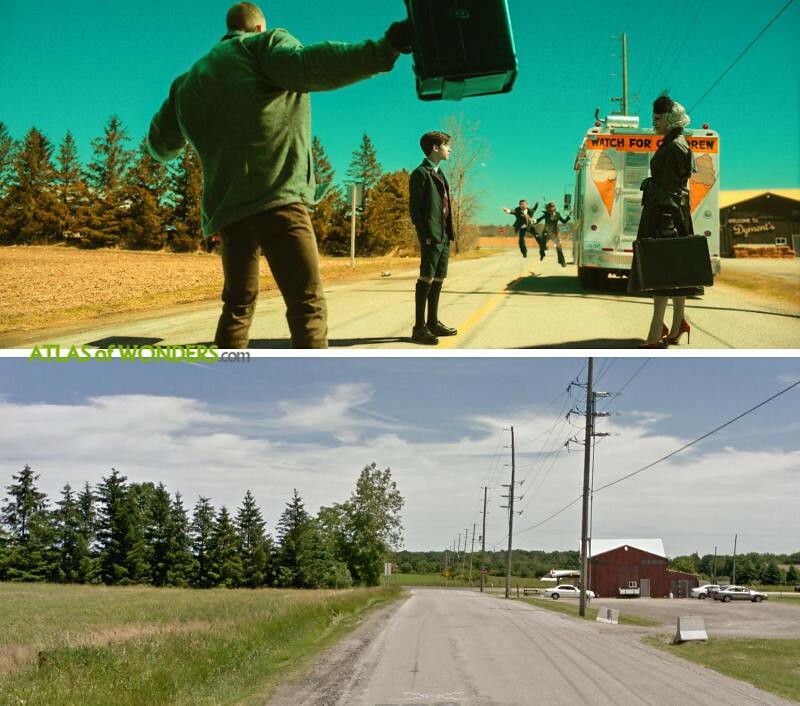 Thanks guys, definitely it is the same house (it was also used in Hannibal series season 3), but we don't know its exact location. Is the interior of the house the same set used in the haunting of hill house and alterd carbon? No because The Haunting of Hill House was filmed in Atlanta and I Altered Carbon in Vancouver. But at first I thought the same because of the movements of the camera and the way some sequences are filmed. 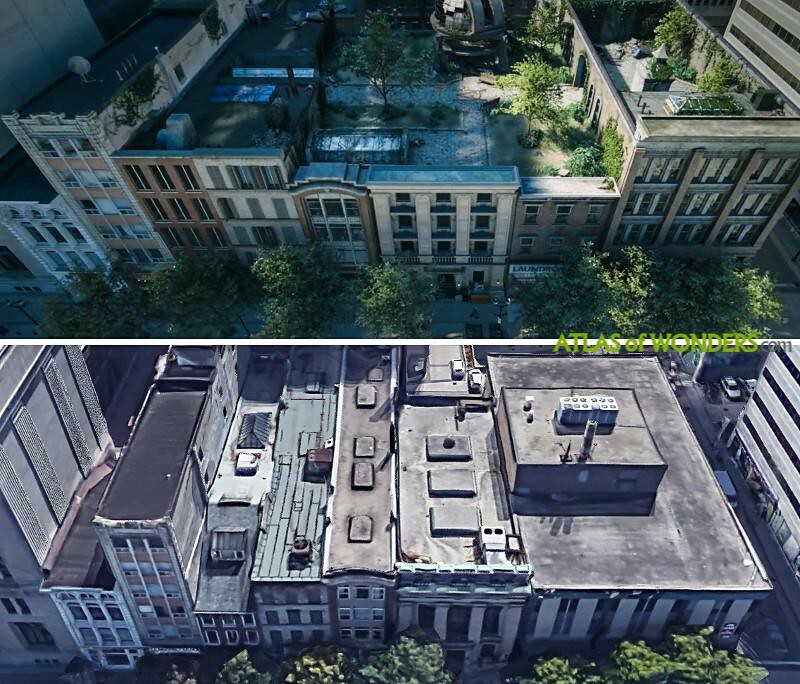 The interior shots of the offices the time people work at are in Casa Loma and one of the locations Vanya goes for her ? audition or rehearsal I can't remember, is Brookfield Plaza across from Union. Could be the Distillery District but it also looks like some pick-up work was done at The Imperial Cotton Company in Hamilton (270 Sherman Ave N.) as well. TICC has buildings of similar Victorian vintage and is very popular with location scouts because it's out of the way and less expensive to shoot at than busy Toronto places like the Distillery District. Thanks Robert, definitely it's the Cotton Factory and not the Distillery District; Both places share the same Victorian architectonic style. I'm trying to pinpoint the restaurant in Episode 4... I could swear I've been there before! 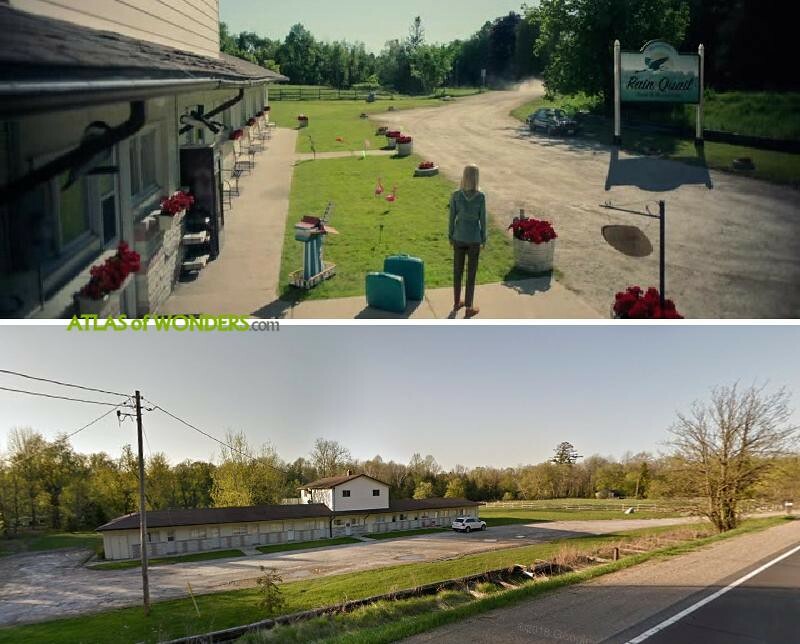 I think the motel in episode 8 is the same one from the Schitt's Creek series. 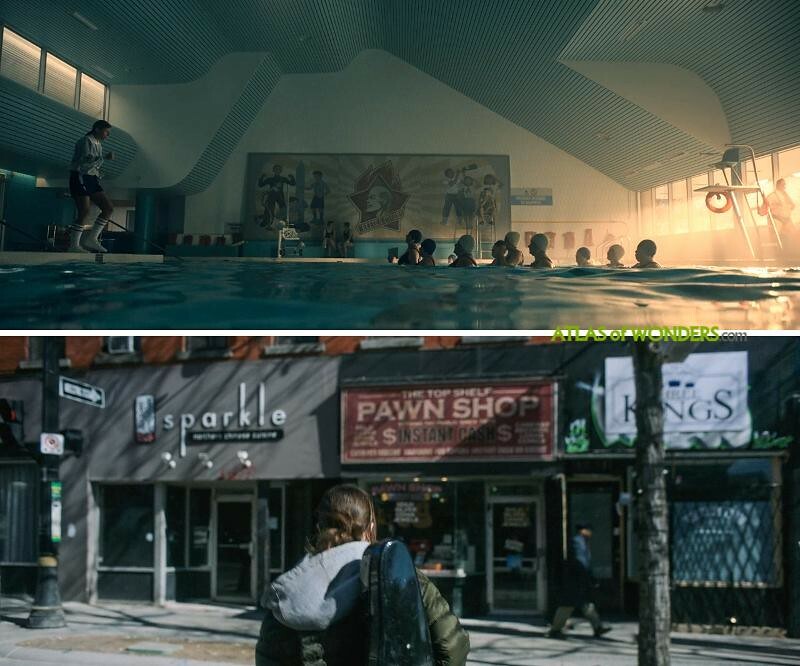 The opening pool scene looks like the Wallace Emerson community centre at Dupont and Dufferin. Thanks to you all for the comments, updated! the department store scenes were filmed at the former target/now treasure hunt store in waterdown, just outside of hamilton! The front of the house, in Hamilton used to be the Embassy nightclub for many many years. When still operating as a nightclub, the back portion caught fire and ceased to operate. Prior to that, it was a bank if I recall. The gates are portable and the concrete pylons they are attached to do not exist on the actual building. The door, exterior lights, and shrubbery were also added or changed. As of this date, some of the other storefronts are real, Red Church for example. 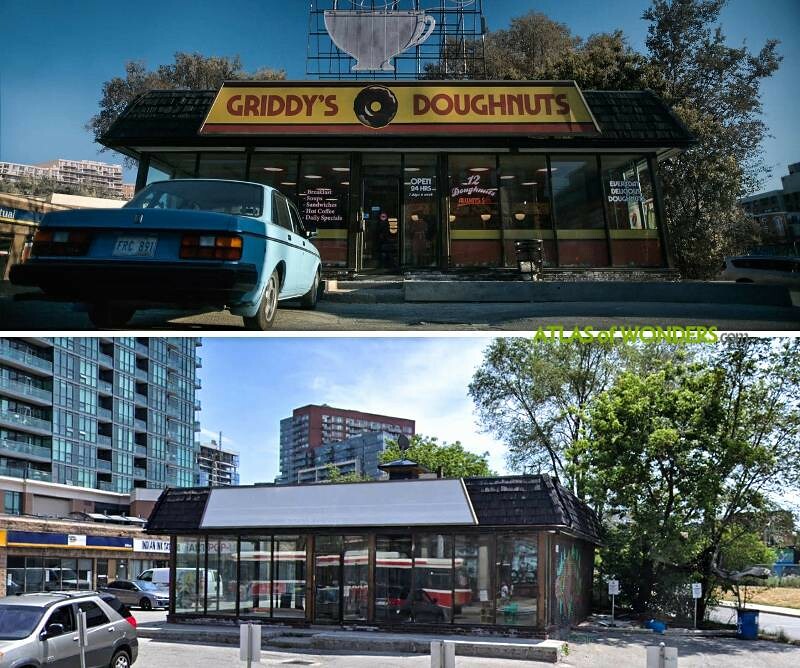 If you drove by it now, it's very easy to pick out as the door is bright blue, as where it was wood and glass in the show and solid wood when it operated as a nightclub. It looks like there's something going on inside. 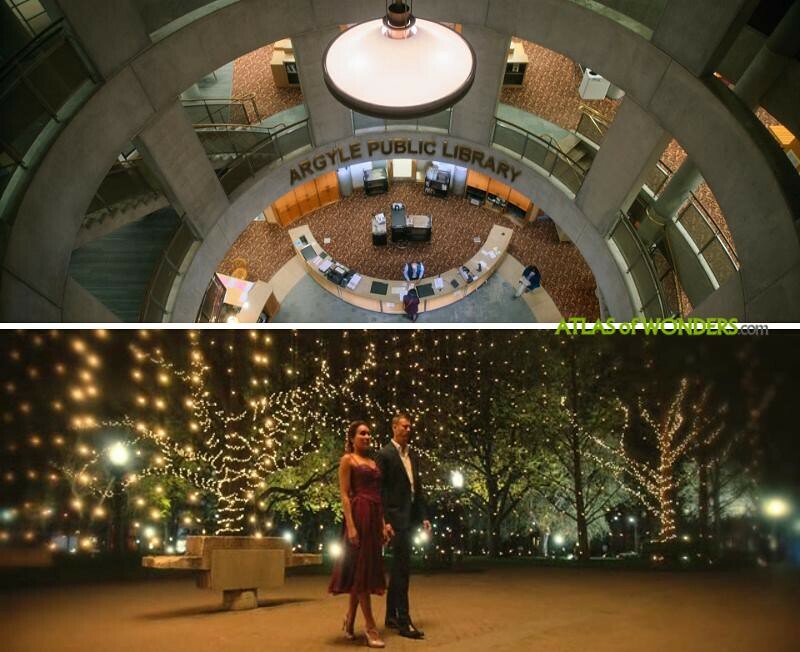 There are some scenes in the show (police station interior, parts of the house interior) which look like they could be inside the same building, or at least drew inspiration from the original architecture of the building, particularly the wrap around balcony. Very interesting, let's see if we can find out more about this! i literally live 3 min away from david dunlop observatory oh my god! The back alley where the dumpster diving happened is off of Leader Lane and Wellington E, right behind the East Thirty-Six that you've already mentioned. The small town in Polar is Orono, Ontario (near Clarington). The scene where 5 is in the car with a knife to the neck of the guy from Meritech, is at the corner of Lower Church st and Esplanade, the same street Titans blew up that car on (closer to the Front St E. corner), the same corner the outside shooting location of the nightclub robin's old friend works as a bodyguard at. I talked to people filming at Holy Cross Priory on High Park Ave. I haven't watched the show yet, so I don't know when it appears. I think that the motel where Hazel and Cha Cha stay is the 400 Motel at 89 & 400. 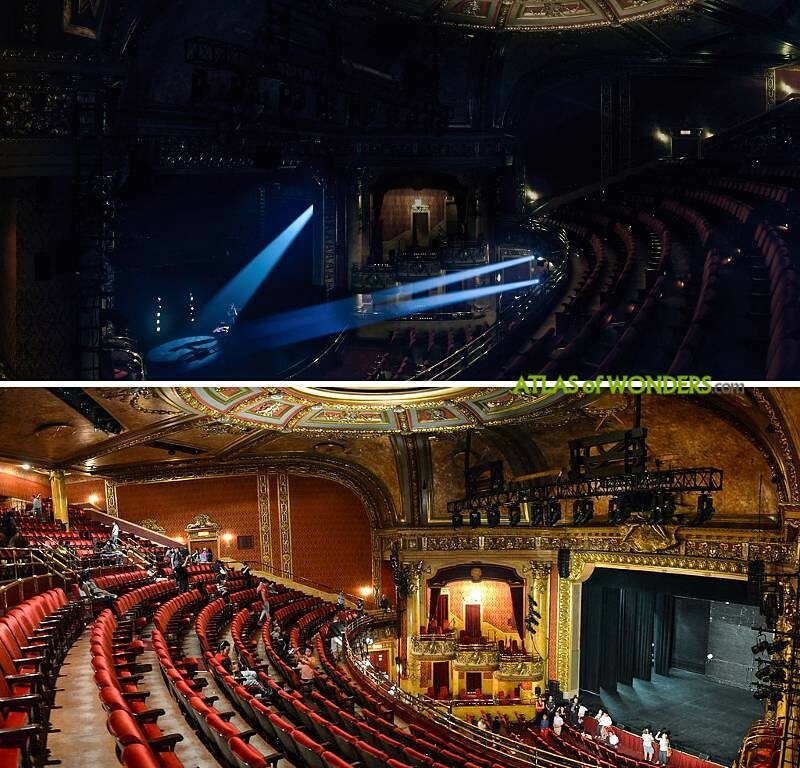 Same place was used in Titans. Can confirm. 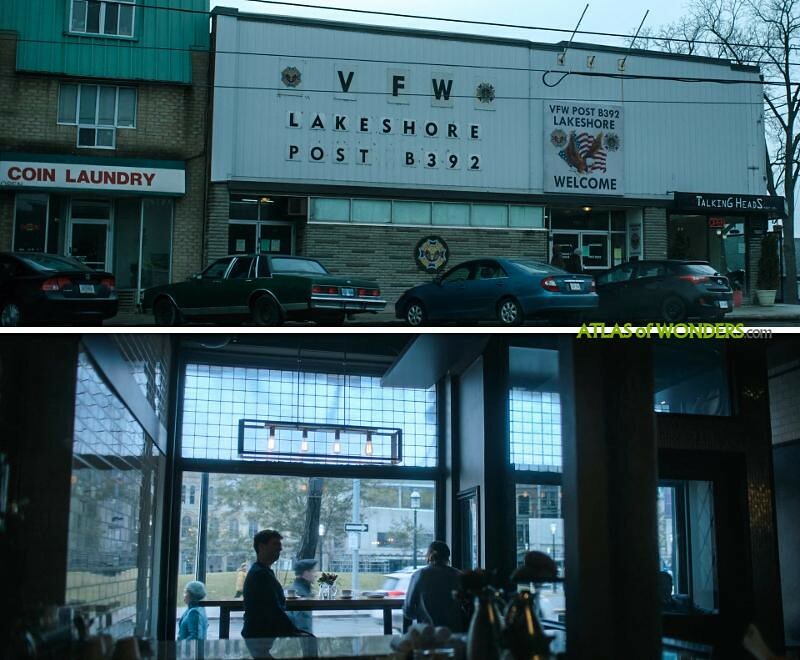 You can also see the reflection of Junction Car Wash at 3196 Dundas St. W. in the bus window during one of Klaus's bus ride scenes. In your list of characters, Diego was left out. We watch Schitt's Creek, and instantly recognized the "Rosebud Motel". 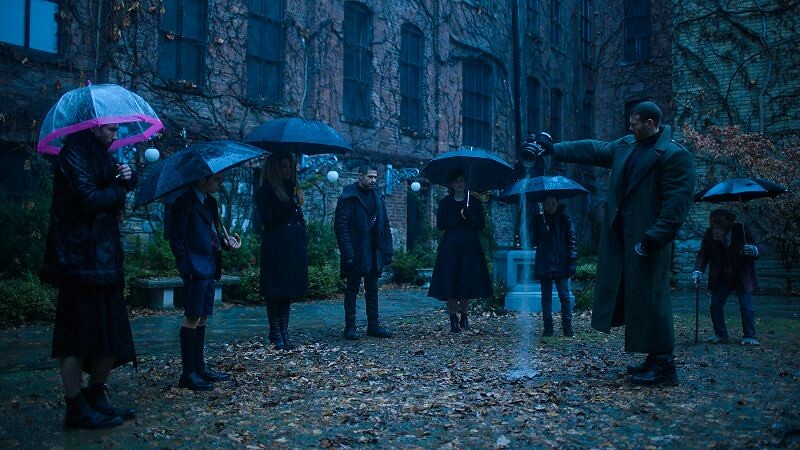 It's the "Rain Quail", in the Umbrella Academy. It looked like the fight scene was shot in the upstairs, judging from the shape of the room. We are fans of both shows. The shots of Number 5 walking/cycling along the road with Deloros over the years at the start of episode 5 are shot on the Indian Line rail crossing in Claireville. Aren't Polar & Ubrella Academy both from Dark Horse Comics? Well Polars graphic Novel any way.